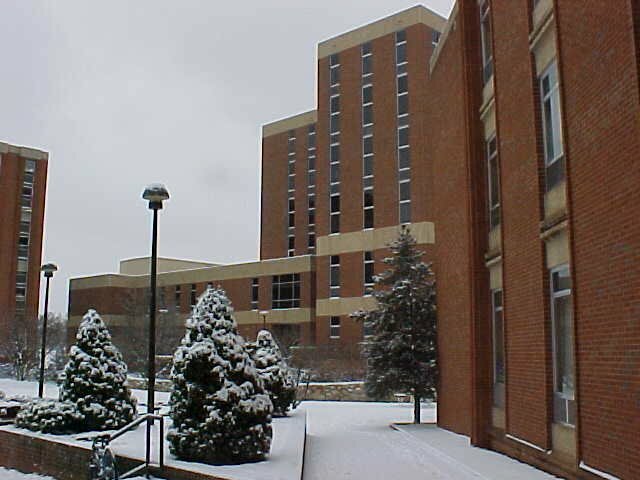 It’s finals week, and I am desperately hoping for a touch of winter to come to Harrisonburg before finals is out. Potomac Hall is practically coming apart at its seams from all the studying going on, and I think we all could use a distraction. Enter Jack Frost, blowing some winter throughout the Shenandoah Valley. This way, JMU could look like this picture from last winter when it snowed, and all of my residents and the rest of the freshman side could go outside and romp around in it. It would be a welcome distraction, as looking out my window right now is just rain, and it’s also cold outside today. If nothing else, we need a little winter weather to lighten the mood around here, ya know? Just enough to get people as excited as last year during finals week, when JMU was blasted with some winter weather (enough to get the 8:00s moved around to 6:00 PM), and people were enjoying it, and we all got to see Potomac Hall in some semblance of winter for the first time. Additionally, the sight of JMU is starting to be depressing (due to finals and related academic stuff), and so hiding part of it in a blanket of snow would create a fresh visual scene and allow all of us to relax a bit. However, when Friday rolls around, and we as a hall staff close the hall, and everyone goes home, the roads would have to be perfect, in order to ensure a safe ride home for everyone, particularly those traveling further than the 30 miles it is to get to Stuarts Draft. Because we don’t want anyone traveling and losing their life due to weather.